Cultural Elements, online at culturalelements.com, showcases a unique collection of culture-infused jewelry, home accents, apparel, and accessories fashioned by traditions from around the globe. Cultural Elements carries a beautiful and rich selection of bracelets, semi-precious stones, pendants, decorative pillows, bedding, ethnic wall art, dining ware, scarves, hand painted pots, decorative boxes and storage, and much more. Cultural Elements also sources a lot of products from the land of their origin. So shop for inspiring and richly traditional gifts from Cultural Elements. But before you shop, save with all the latest culturalelements.com discounts, Cultural Elements promotions, and Cultural Elements coupon codes found here at RetailSteal.com. Cultural Elements ships within the United States, Canada, and other international destinations. 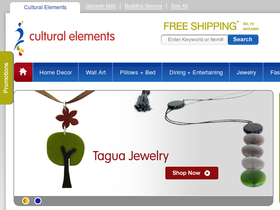 Cultural Elements offers free shipping within the continental U.S. on most products. See site for more information. Save up to 60% on select gifts and home decor in the sale section at Cultural Elements. Click here and shop and save. Enjoy free shipping on all orders shipped to the continental United States from Cultural Elements. Click here to enjoy savings. Save up to 60% on gifts in the sale section at Cultural Elements. Shop today and save. Shop for African fair-trade jewelry starting from $10 at Cultural Elements. Click here to shop now. Shop for best sellers starting from only $10.99 from CulturalElements.com. Click here to shop. Shop colorful Tagua jewelry, starting from only $15 from Cultural Elements. Click link to shop.